Who can forget the paper review on one past edition of The Andy Marr Show™ where self-promoting TalkRADIO host Julia Hartley Brewer objected to being referred to as a “Conservative” commentator? She was most put out about that. But whatever her opinion, it is all too clear that while she can get away with not being described as Conservative, it is only because she is rather further to the right than that. 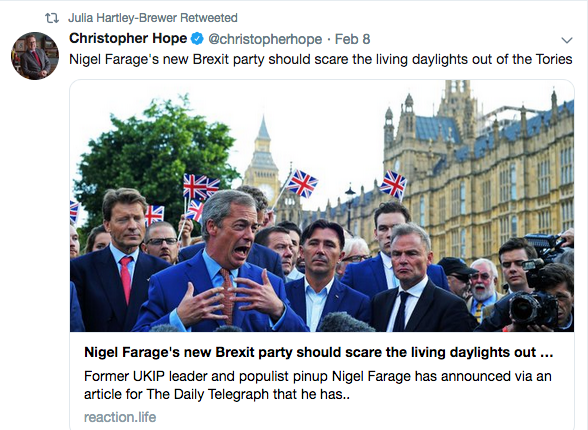 Ms Hartley Dooda’s Twitter feed tells you all you need to know about her lurch to the far right, and indeed her now being enamoured of former UKIP Oberscheissenführer Nigel “Thirsty” Farage, though whether Nige fancies the idea is not known. 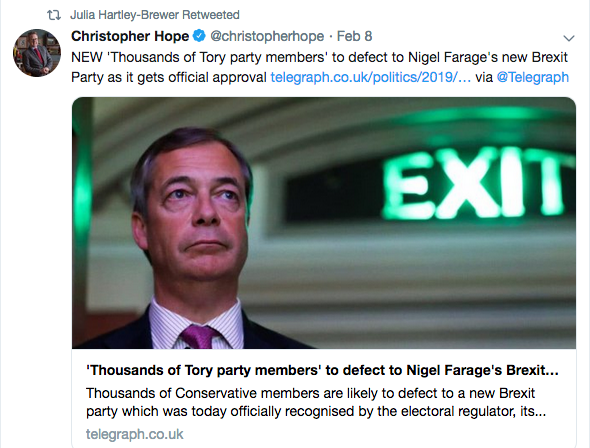 When Christopher “No” Hope of the Telegraph told his adoring followers “NEW 'Thousands of Tory party members' to defect to Nigel Farage's new Brexit Party as it gets official approval”, there was Ms Hartley Dooda to agree. One might have thought that a seasoned journalist would stop and think - especially about Hope shilling for anyone out there on the right who wants the hardest possible Brexit - but no. 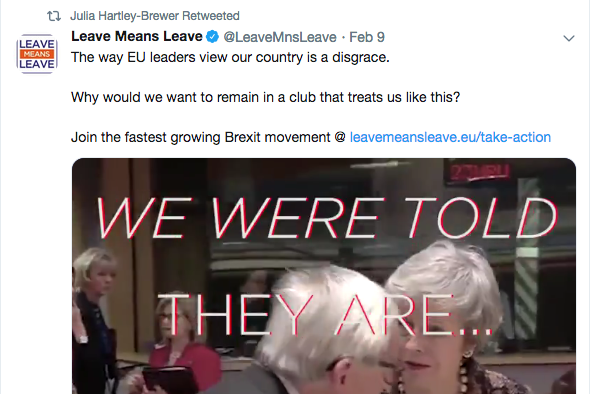 After Donald Tusk did his job of flushing out those Brexiteers who urged the course with no plan as to how to do it, Ms Hartley Dooda endorsed Faragist fringe group Leave Means Leave who whined “The way EU leaders view our country is a disgrace. Why would we want to remain in a club that treats us like this? Join the fastest growing Brexit movement”. The club isn’t treating anyone like this. It’s calling out the guilty men. And women. Could she shill any more enthusiastically for Mr Thirsty? You bet. So when Hope told “Nigel Farage's new Brexit party should scare the living daylights out of the Tories”, there she was again, letting her own followers know The One True And Only Way. Not everyone was cheering for the new Farage vehicle, and one of those was Tottenham MP David Lammy. 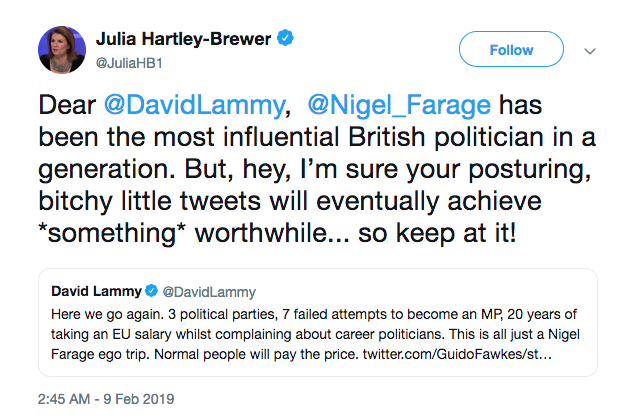 Ms Hartley Dooda showed her total lack of political bias by scolding him “Dear @DavidLammy, @Nigel_Farage has been the most influential British politician in a generation. But, hey, I’m sure your posturing, bitchy little tweets will eventually achieve *something* worthwhile... so keep at it!” Influential? Inebriated, more like. 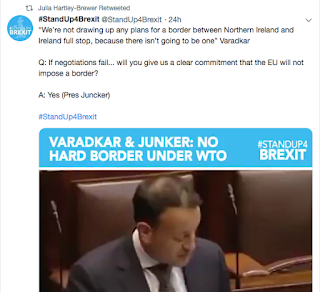 Then she decided to endorse Stand Up For Brexit, who had told “‘We’re not drawing up any plans for a border between Northern Ireland and Ireland full stop, because there isn’t going to be one’ Varadkar Q: If negotiations fail... will you give us a clear commitment that the EU will not impose a border? 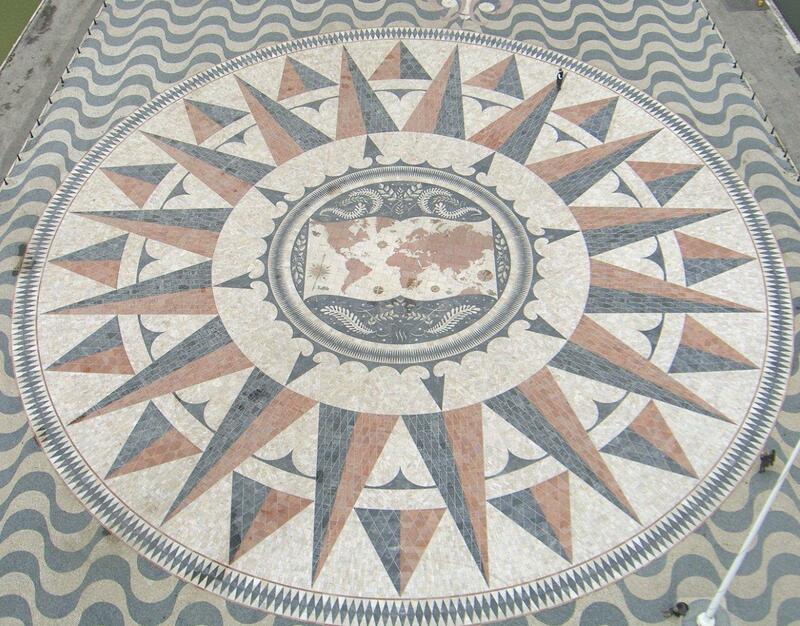 A: Yes (Pres Juncker)”. SUFB is the Tory headbanger fringe - Steve Baker, Priti Patel, Iain Duncan Cough, that level of integrity. She was backing spin over the Irish border issue, rather than entering into any kind of intellectual or investigative process. 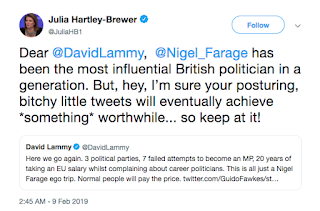 And when David Lammy responded to her adoration of The Nigel by pointing out that Mr Thirsty was a spiv and a chancer (he could have added congenital liar to those), she simply sneered “Ha ha. Bitter much?”. 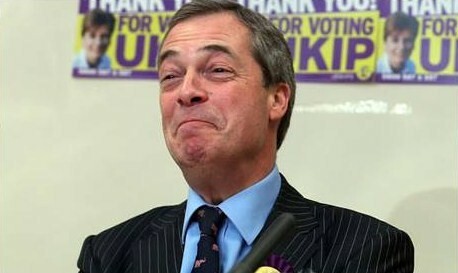 How a several-times re-elected MP can be bitter at a dishonest gobshite who has tried - and failed - to get into Parliament seven times is an interesting one. But when you’ve lurched to the far right, the whole continuum of reality shifts with you. 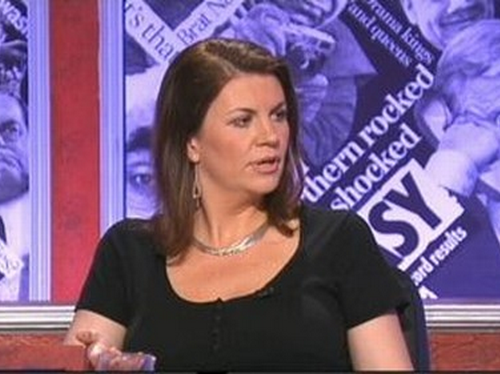 Julia Hartley Dooda is not Conservative. She’s far more right-wing than that. Sounds rather like "Falangist". Unsurprisingly. 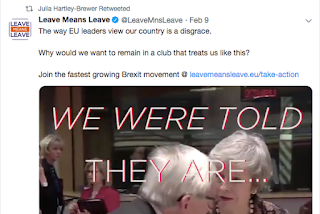 Hartley-Divvy has always been far right, as are most other tories. None of them can be trusted. Nor can any of their fellow travellers. “The only way we can avoid a hard border between Ireland and Northern Ireland is having an agreement on customs, common customs union and regulatory alignment and that’s what we negotiated in the withdrawal agreement and the backstop.” - Varadkar. 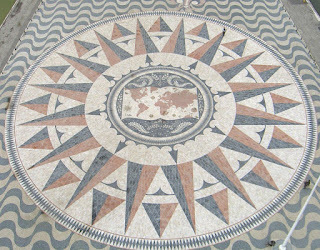 16 January 2019. I've yet to hear a Brexiter even try to explain how we can control our borders and keep the Irish one open. If there is a technological solution, why isn't the whole world using it?